Who's the newest team to blast onto the NFL scene? The LA Chargers! Okay, okay. Not a new team, but they are in a new city, and ready to excite Los Angeles fans from all over the valley! 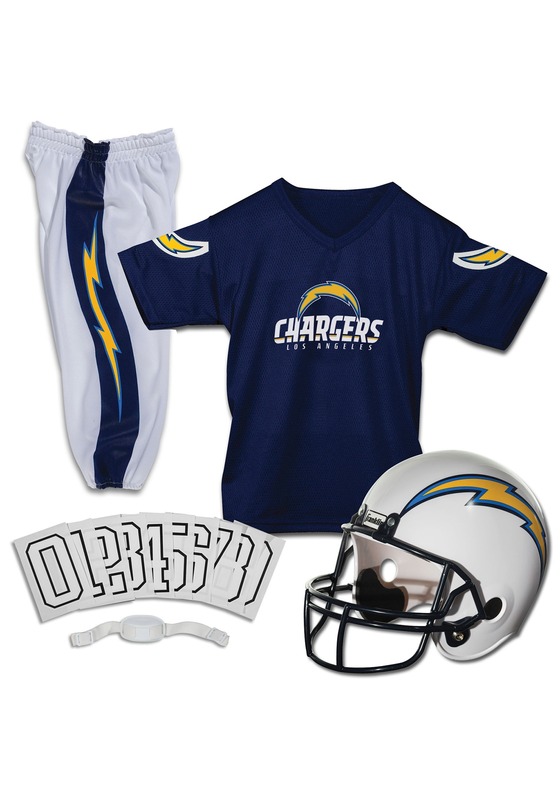 This Chargers NFL deluxe helmet/uniform set will create a ton of memories for your little guy or gal this Halloween. Because they're going to be a member of their favorite team. They can punt, pass, and kick the ball, or just have a ball pretending to be their favorite NFL superstar. The full costume kit comes with an officially licensed blue polyester jersey mesh jersey with the Chargers name and logo printed on the front. The white football pants have an elastic waistband and cuffs for a comfortable and authentic fit. The pants also have a blue side stripe and lighting bolt - after all, he’ll act like he’s been charged by lightning when he takes off across the field! The white helmet has the signature Chargers lightning bolt, facemask, and a snap-on chin strap that provides a secure fit all night long. The back of the jersey is blank so you can iron on your favorite numbers, which come with!